Copeland Desktop gives you an even easier way to interact with our Project System to create and manage projects with Copeland Technology Solutions. With Copeland Desktop, you can see where your open projects stand, and easily see which projects we may be waiting for your input on. The current Project Leader is highlighted in the list of associates, and their help is just a click away via chat, email, or phone call request. 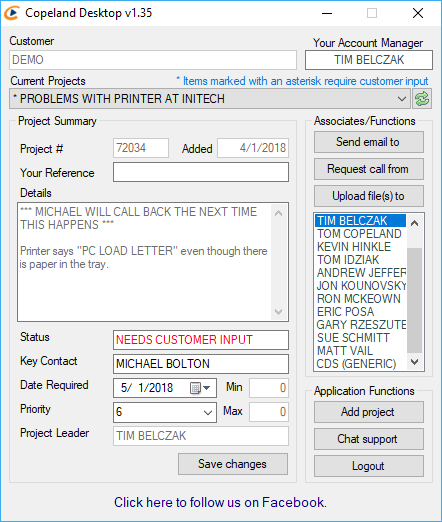 Easily add a project or request a quote. Instant access to status and estimated completion dates (view or change). Application sits in your system tray for quick access whenever you need it. File transfer functionality enables you to easily upload files that are too big to email. Our current service supports files up to 2 gigabytes in size. Select any associate from list and click to email, request a call, or upload a file. Version 1.3 runs much faster than previous versions. Copeland Desktop is a "distributed application" that runs on a Microsoft's .NET Framework using remote XML (SOAP) requests over the Internet. To run the Installer, you will need Microsoft's .NET Framework 2.0 installed on your computer. If you do not yet have it installed, you can download it HERE. The current verison of Copeland Desktop is a single executable (.exe file) that does not need to be installed. Download the file (CopelandDesktop.exe) and save it in a convenient location for you to run whenever needed. If you want to add it to your programs at startup, follow the instructions HERE or give us a call! If you are interested, we would be very happy to tell you more about this technology and how it is used to connect remote systems. If you currently sign into Copeland Online or Copeland Mobile Connect with your email address and a password, you already have everything you need. For a username and password, please call us at (716) 692-7773.